They say absence makes the heart grow fonder. This is certainly true in most cases, yet there are times when it can have the opposite effect, affording couples the opportunity to travel in different directions, meet different people, and lead entirely different lives. Inch’allah Dimanche, a heartbreaking film about a woman forced to leave her home and move to a foreign land, relates one such story. Zouina (Fejria Deliba), an Algerian housewife, is sailing to France with her three children and her abrasive mother-in-law (Rabia Mokeddem) so that she can be reunited with her husband, Ahmed (Zinedine Soualem), who, for years, has been working in that country. But the reunion will not be a happy one. Finding it difficult to adjust to life in France, Zouina quarrels with her new neighbor, Mrs. Donze (France Darry), and spends more money on groceries than her husband allotted. Each of these transgressions brings about a beating from Ahmed, which causes Zouina to slip even further into despair. From the outset, its clear neither Ahmed nor Zouina are particularly happy to be together again. When Ahmed greets her at the port, Zouina, who hasn't seen her husband in years, can only think of how she'd forgotten he had a mustache. Ahmed is also uncomfortable with the sudden reemergence of his family, and begs his co-worker (Mohamed Fellag), who accompanied him to the port, to now join them for a cup of coffee so that he won't be left alone with Zouina. The miles between them have taken their toll, and now, man and wife are veritable strangers to one other. Zouina does eventually settle in, but finds herself at a psychological crossroads shortly after doing so. She strikes up a friendship with Nicole (Mathilde Seigner), a divorced neighbor who introduces her to makeup (which she was forbidden to wear in Algeria), and discovers she likes listening to talk shows on the radio. Zouina even learns to enjoy her trips to the supermarket, mostly because it's one of the few times she’s permitted to go out of the house by herself. Growing accustomed to her new surroundings, she is also leaving her old life behind, something that doesn't sit well with the rest of the family. 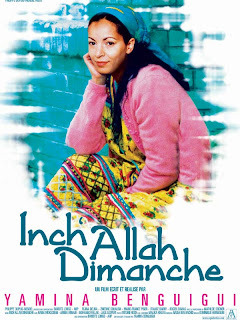 Fejria Deliba is wonderful as Zouina, a woman making the best of a desperate situation, and though the climactic scene of Inch’Allah Dimanche is a bit too tidy, not to mention out of place in the context of all that preceded it, Deliba's performance more than makes up for any of the film's shortcomings. By the end of Inch'Allah Dimanche. Zouina has evolved well beyond her family, her husband, even her upbringing. She's become an individual, and considering where her journey began, this is an impressive accomplishment, indeed.